I was Googling a new restaurant that is to be opening up in Highlands, NJ this week. A funny thing happened.. Yelp! was the first result back. Not so surprising. However, that they had 2 reviews already and the place hadn’t even opened it doors yet, struck me as odd..
Sooo Lin, ” Friendly staff and great English bartender. We had a great time with some family and friends.” – Really, how’d you do that? It hasn’t even opened yet.. Note to self, Yelp! reviews need to be taken with a grain of salt. 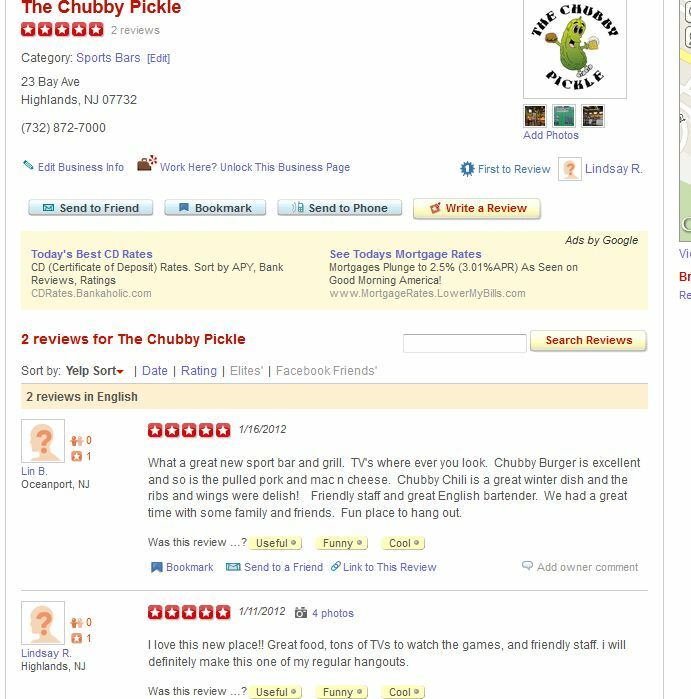 Note to Chubby Pickle, you should have waited until after you opened to post fake reviews.. ~ just saying..
Actually there have been several friends and family events at the pickle, and the reviews happened to be written by two people who attended. The doors are opening to the rest of the public tonight. So in fact they aren’t “fake” reviews. @laura – when exactly have there been “friends & family” events? The two reviewers initiated their Yelp! profiles this month (Jan 12) they both only have 1 review, AND the 2nd reviewers pictures don’t have any people in the pictures – They are obviously fake reviews. That being said, I know you are opened tonight because I happened to drive by. I wish you well & success. I was at one this past Sunday for the Giants game, there were about 50 of us there and we all ordered food and watched the game. I know there was one other one the week before but I can’t say for sure when. I know they were testing out the menu etc before they opened to the public. I am sure other friends and family rated it in hopes of helping them out and wishing them well. What can I say, other than good luck to them! i would like to know what time they open and whats on their menu for food and beers. is there a website for the chubby pickle to see that? I haven’t seen a website – I believe they have a facebook page – but it doesn’t have their hours or menu on it..
As one of the owners I take offense to the accusations of “fake reviews”. We had a soft opening on Jan.15th for friends and family to introduce the bar. Just like anyone else, they can post a review about the bar describing their experience. I would appreciate it next time that you have all your facts correct before publishing about our business. As for the size of the TV’s……..please!! The reviews were posted before you opened. According to you, you had a soft opening on 15th.. hmmm one of the posters posted their review on the 11th.. what were they psychic? I’m offended you, as the owner, when you can’t put on your big boy pants and just accept some productive criticism. I went in once, the experience wasn’t stellar and based on you and your friend’s aggressive comments, won’t be back, nor will I recommend you to anyone. Most times, in a restaurant if you have patron with a negative impression, the norm is to use more honey than vinegar. But hey, to each their own. And for the record, the bash was really geared to Yelp reviews, and needing to take them with a grain of salt and not as gospel. Your criticism was anything but productive, as is your blog. We are trying to bring business into your community and all you can do is sit at your computer and write negative comments. Just the kind of person I don’t want in my bar, so thank you for not coming back.